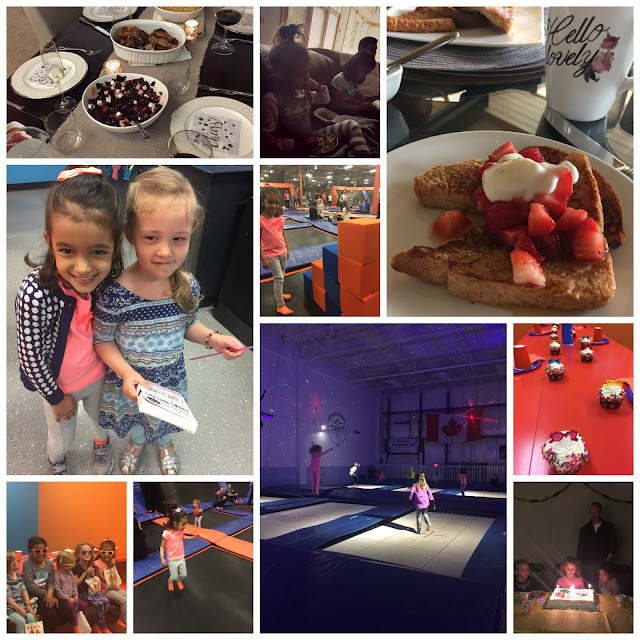 it's my girls' world: Weekending- last weekend of April! Happy May and Monday, friends and random family members who follow along! - Saturday was totally lazy. We did make vanilla french toast for a late and lazy breakfast that my kids dominated like it was their job. - All four of us napped at one point or the other. - We watched La La Land and ordered chinese takeout appies with another dish for the kids. Their shrimp wanton soup and chicken lettuce wraps is on our craving list every couple weeks. - We ended the night with appies, curry chicken pie, a salad and some wine. Linking up with the awesome Biana for Weekending. Two trampoline parties in one day, WOW! Jumping is an intense workout. I used to always giggle that I could run 10 miles but 10 minutes of jumping would still do me in. Good for you for getting in on the jumping! What a fun weekend! That french toast looks so good! OH a nap, I could use one too. Looks like a great weekend, full of fun and good food.